Ramshackle Games has a new Iron Brothers unit, available in two unit sizes, and some new head swaps for them, available over in their webshop. Following on from last weeks release of the Rhebok transport vehicles, I have just released two sets of Iron Brothers soldiers. They are resin figures, which measure about 28 or 29 mm to the top of their heads. One set is 10 models for £10, the other is 20 figures for £16. Yes, thats right, 20 resin figures for £16, making them 80p each! 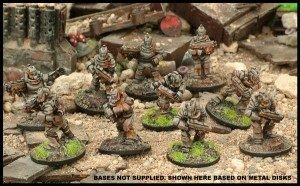 Great for making large assault groups with. The heads are also available separately too, at £4 for 10.